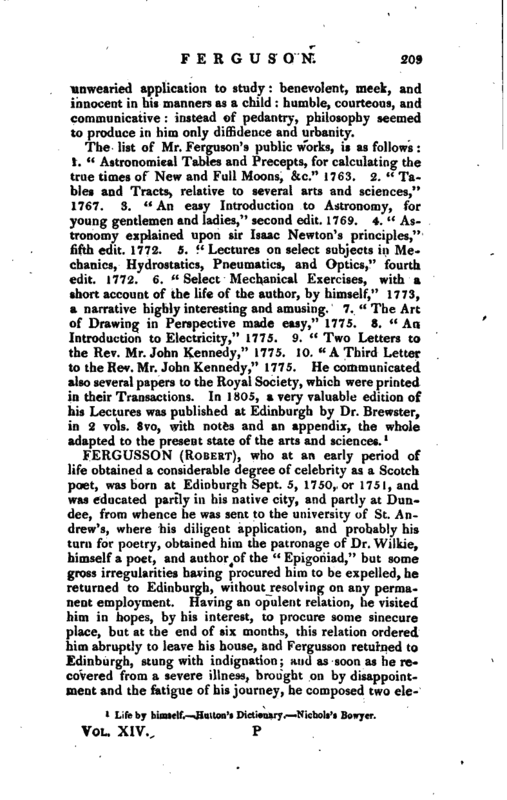 , who at an early period of life obtained a considerable degree of celebrity as a Scotch poet, was born at Edinburgh Sept. 5, 1750, or 1751, and was educated partly in his native city, and partly at Dundee, from whence he was sent to the university of St. Andrew’s, where his diligent application, and probably his turn for poetry, obtained him the patronage of Dr. Wilkie, himself a poet, and author of the “Epigoniad,” but some gross irregularities having procured him to be expelled, he returned to Edinburgh, without resolving on any permanent employment. 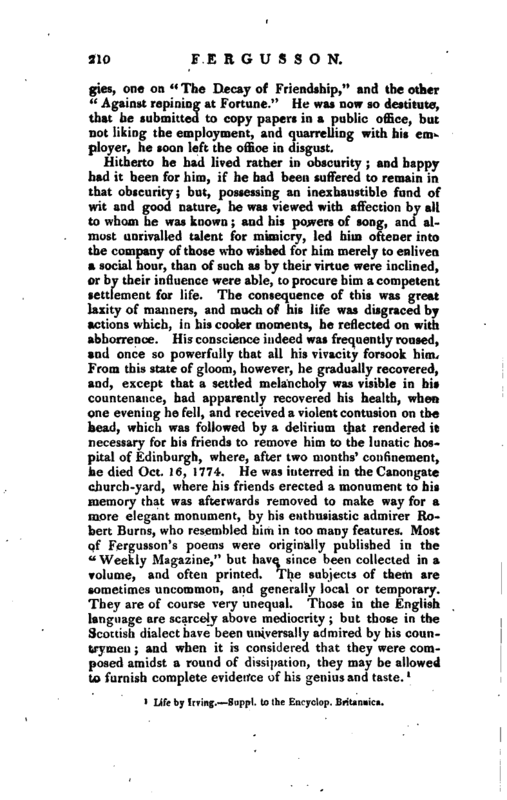 Having an opulent relation, he visited him in hopes, by his interest, to procure some sinecure place, but at the end of six months, this relation ordered him abruptly to leave his house, and Fergusson returned to Edinburgh, stung with indignation; and as soon as he recovered from a severe illness, brought on by disappointment and the fatigue of his journey, he composed two | elegies, one on “The Decay of Friendship,” and the other “Against repining at Fortune.” He was now so destitute, that he submitted to copy papers in a public office, but not liking the employment, and quarrelling with his employer, he soon left the office in disgust. 1 Life by Irving. jsuppl. to the Eru’yclop. 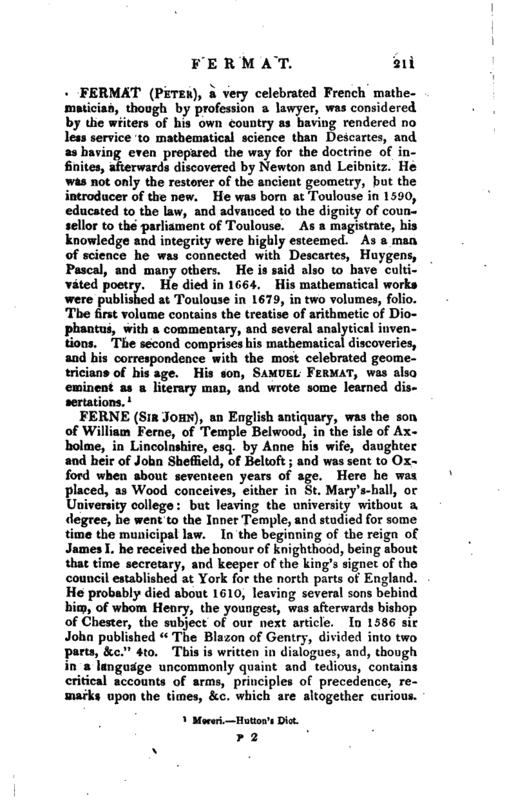 Britannica.